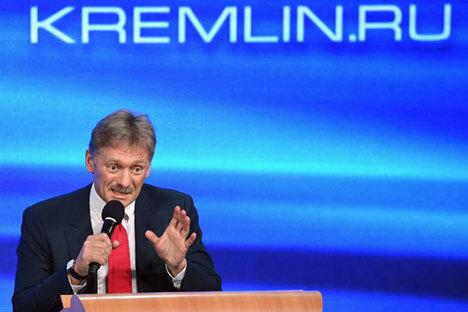 Dmitry Peskov: Moscow still seeks cooperation with Washington. The Kremlin regrets that the West has chosen an unconstructive rhetoric against Russia, presidential spokesman Dmitry Peskov told reporters on Sept. 29. "In general, we regret this rather unconstructive character of rhetoric coming from Washington of late," he said. Moscow still seeks cooperation with Washington both for implementing the agreements on settlement in Syria and increasing the efficiency of the anti-terrorist fight in the country. "Of course, Moscow hopes that the commitments undertaken by Washington will be implemented. But unfortunately now they are not being fulfilled," Peskov said. On Sept. 28, U.S. State Department spokesman John Kirby said one of the consequences of the war in Syria could be extremists’ "attacks against Russian interests, perhaps even Russian cities." "And Russia will continue to send troops home in body bags," he said. Peskov said this statement is "awkward." "That’s all that can be said," he added.